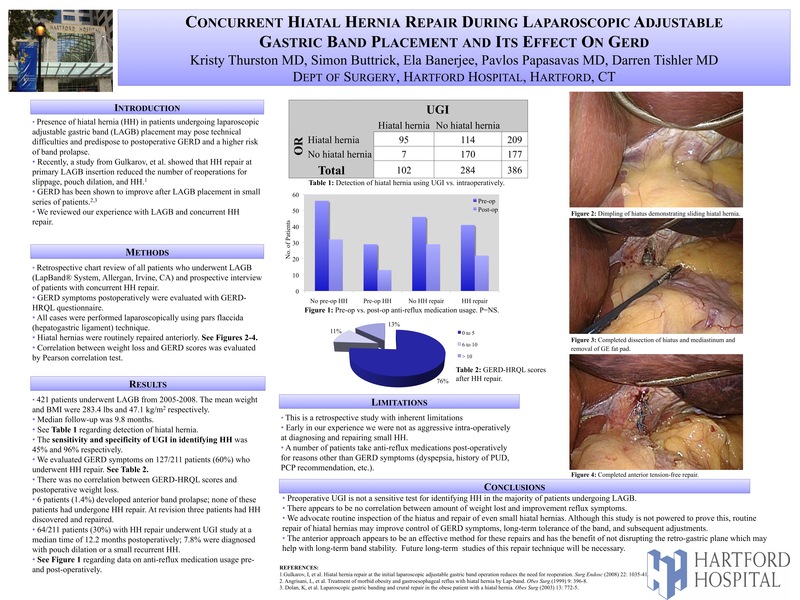 Introduction: Presence of hiatal hernia (HH) in patients undergoing laparoscopic adjustable gastric band (LAGB) placement may pose technical difficulties and predispose to postoperative GERD and a higher risk of band prolapse. We reviewed our experience with LAGB and concurrent HH repair. Methods: Retrospective chart review of all patients who underwent LAGB and prospective interview of patients with concurrent HH repair. GERD symptoms were evaluated with GERD-HRQL questionnaire. All cases were performed laparoscopically using pars flaccida technique. Hiatal hernias were routinely repaired anteriorly. Correlation between weight loss and GERD score was evaluated by Pearson correlation test. Results: 421 patients underwent LAGB from 2005-2008. The mean weight and BMI were 283.4 lbs and 47.1 kg/m2 respectively. Median follow-up was 9.8 months. Of the 403 patients with preoperative UGI data available, 119 patients (30%) had radiographic evidence of HH. 211 patients (52%) underwent HH repair at the time of LAGB. 19 patients with positive UGI did not undergo HH repair due to inability to identify a hernia or technical reasons. Two patients underwent posterior crural repair due to the large size of the hernia. The sensitivity and specificity of UGI in identifying HH was 45% and 96% respectively. We evaluated GERD symptoms on 127/211 patients (60%) who underwent HH repair; 76% of patients reported scores 0-5, 11% scores 6-10 and 13% scores>10. There was no correlation between GERD-HRQL score and postoperative weight loss. Two patients developed anterior band prolapse, one of which had prior HH repair. 64/211 patients (30%) with HH repair underwent UGI study at a median time of 12.2 months postoperatively; 7.8% were diagnosed with a small recurrent HH. Conclusion: Preoperative UGI is not a sensitive test for identifying HH in the majority of patients undergoing LAGB. We advocate routine inspection of the hiatus and repair of HH during LAGB. This approach effectively controls GERD symptoms and may improve long term LAGB tolerance.